Kelly Murray, food service manager at the James Doughty School in Bangor, prepares lunch before the kids file through the cafeteria on Thursday. 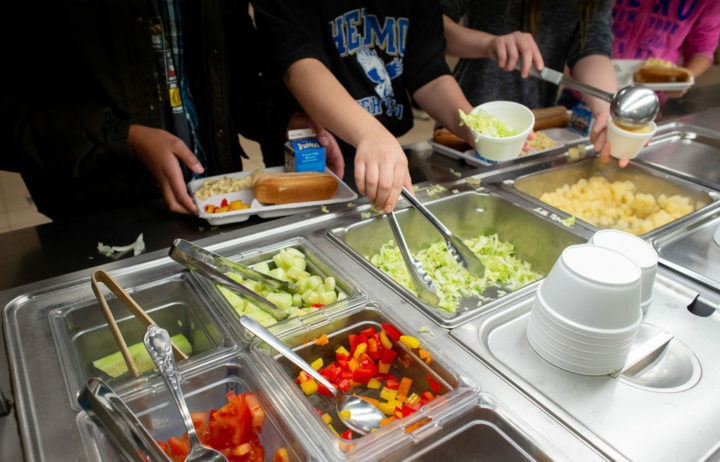 Bangor schools will stick to more demanding nutrition standards for school lunches even as the federal government officially relaxes them next month. New guidelines from the U.S. Department of Agriculture that take effect in February will ease up on some school nutrition guidelines first established during the Obama administration. 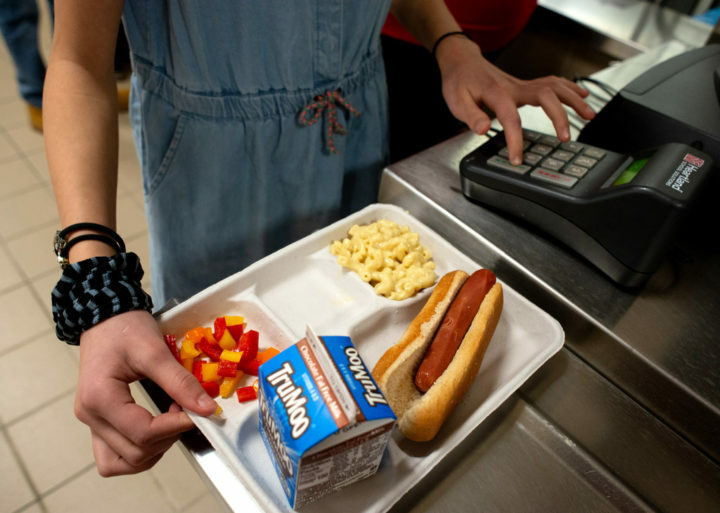 Under the Trump administration’s new rule, schools can serve items that include low-fat chocolate milk and white bread that have been banned since 2012 in favor of more nutritious alternatives. School districts will have the option of continuing with the higher nutrition standards, and Bangor is one of the districts that will keep adhering to the 2012 standards. Under the new guidelines, schools will be able to offer flavored low-fat milk as an alternative to fat-free milk. Whole-grain rich food will only be mandatory in half of all weekly meals, instead of at every meal, which will allow for the use of less nutritious refined grains. School districts will still be required to continue lowering sodium levels in meals, but they can do so more slowly under the Trump administration’s new rule, reaching target levels later. Students add fruits and vegetables to their trays during lunch at the James Doughty School in Bangor on Thursday. “We’ll continue with our whole grains and fat-free milk, and the sodium levels will stay,” Scott said. The Trump administration says it wants to provide more options for schools and address any menu planning challenges districts have faced in implementing the more stringent 2012 guidelines. But the changes have been the subject of intense debate since the administration released the interim rule in 2017. Dr. John Warner, president of the American Heart Association, called the rule change “counterproductive” after schools had made their menu offerings more nutritious to comply with the 2012 requirements. The change “may jeopardize children’s health, well-being, and resulting academic success,” Warner wrote in a January 2018 letter to the USDA. “Schools will continue to meet strong nutrition standards but can prepare meals that appeal to a wide range of students,” Gay Anderson, the association’s president, said in the statement. Bangor schools haven’t faced problems adapting to more stringent nutrition requirements, and students have adjusted well, Scott said. Students get their lunches at the James Doughty School in Bangor on Thursday. Scott’s observations about students adjusting to the stricter food guidelines are backed up by studies showing the Obama-era rules resulted in more fresh fruit consumption and did not lead to increased food waste, which the Trump administration has claimed. And food suppliers have adapted, offering a wider variety of whole-grain alternatives to refined-grain products, for example. Dairies have offered flavored fat-free milk to comply with the Obama-era rules. 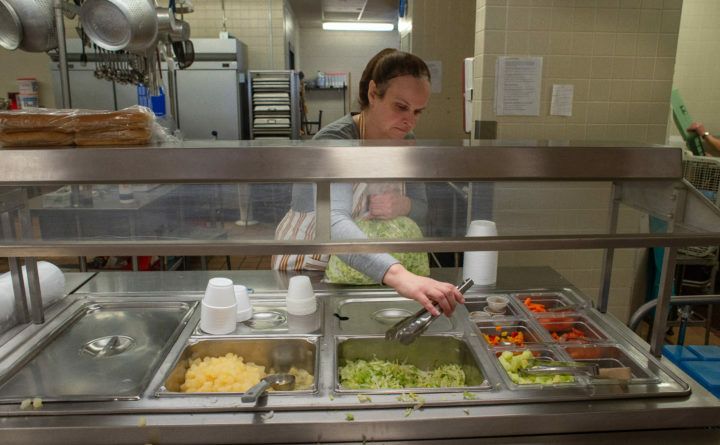 Bangor schools serve whole-grain bread and flavored fat-free milk, and students aren’t clear on the difference, said Sharon Belanger, who prepares and serves food at Bangor’s James F. Doughty School. On Thursday, Belanger said the middle-school students were happy with their lunch choices, especially the macaroni and cheese. The hot dogs with whole-grain buns proved less popular.